If recent trends in workplace substances are any indication, I have a feeling you meant to search for a comparison between Nootrobox & LSD, not Nootrobox & Mind Lab Pro. The former nootropic stack seems to jibe well among the Silicon Valley community, considering its origins in Silicon Valley. Yet, so is the rising trend of “micro-dosing” LSD in the workplace a patently Bay Area, CA invention, which I don’t think I have to tell you isn’t the healthiest option of mind altering substances. Which is why perhaps I need to introduce you to Mind Lab Pro, an entirely brain healthy mental performance enhancer that won’t have you chasing “Paul McCartney is Dead” conspiracy theories. In reality, Nootrobox has more in common with Mind Lab Pro than it does with psychedelics, so perhaps you are in the right place. Nootrobox or Mind Lab Pro: Which is better? 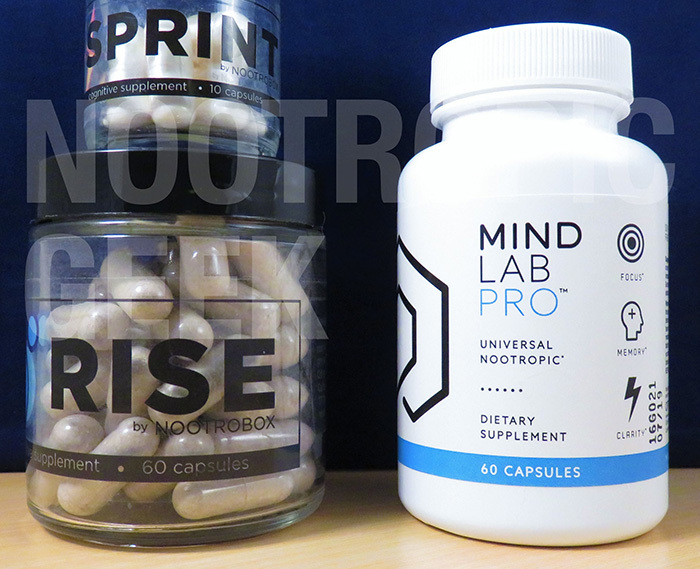 For one, Nootrobox has two bottles for its RISE + SPRINT supplements, whereas Mind Lab Pro contains its formula in only one bottle. So Nootrobox is better than Mind Lab Pro, right? RISE: Mixing equal parts Bacopa, Rhodiola, & Alpha-GPC for stress-free focus boosts & cognition enhancing memory support. SPRINT: B vitamins, Vinpocetine, L-Tyrosine, and the classic L-Theanine + Caffeine combo for more immediate stress-free focus boosts. If RISE is a non-stimulatory “get-up-and-go” stack, SPRINT is the early-morning, mid-day push to keep the “go” going. 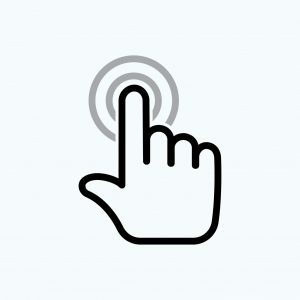 At the least, SPRINT works as an “as-needed” mental kickstart, which makes for a great, quick nootropic complement to the more long-term beneficial RISE stack. Read my in-depth review on Nootrobox. Whether you’re old or young, studious or athletic, active or lazy, MLP has something for you–although, “lazy” users would be wasting their optimized brain power. As such, MLP is a highly “bio-active” brain booster stack for highly active users. And in true nootropic fashion, it accomplishes all of this without relying on caffeine. Read my in-depth review on Mind Lab Pro. The human brain on Mind Lab Pro. 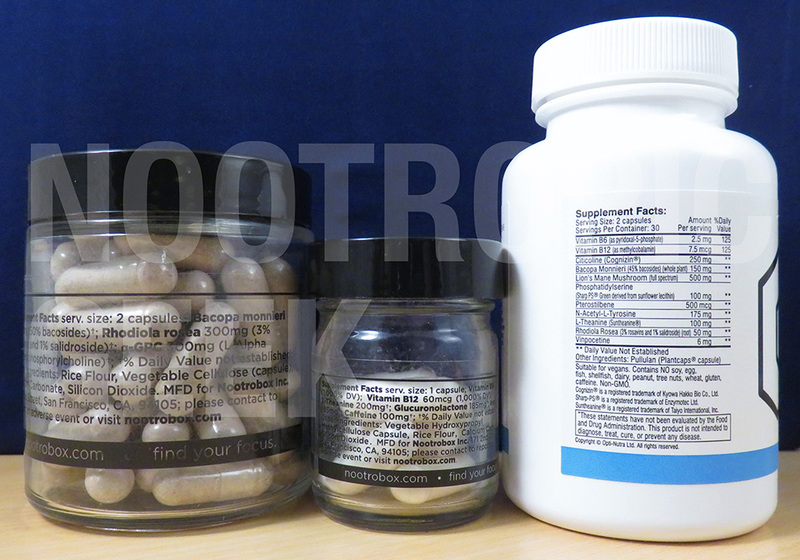 Plenty of ingredients are shared between these formulas: Bacopa, Rhodiola, L-Theanine, L-Tyrosine, Vinpocetine, B6, & B12. Bacopa Monnieri (50% bacosides): Slightly outperforms Mind Lab Pro’s Bacopa by an increased 5% bacosides extract. Alpha-GPC: I prefer the Citicoline found in Mind Lab Pro, but as a choline source Alpha-GPC actually has a higher concentration of choline. Separate Stacks: In total, there are four different products under the Nootrobox name, giving you various mix-and-match options, depending on your brain needs. Citicoline (as Cognizin®): The premium form of perhaps my favorite nootropic Citicoline. I consider this better than Alpha-GPC for its enhanced nootropic potential. Phosphatidylserine (as Sharp-PS®): Sunflower-derived brand of multi-purpose nootropic phosphatidylserine. How neato burrito is that? Pterostilbene: Compared to Resveratrol, Pterostilbene is largely considered the better antioxidant, serving a healthy dose of neuroprotection. N-Acetyl-L-Tyrosine: Nootrobox has anti-stress L-Tyrosine, but Mind Lab Pro has the more bio-active N-Acetyl-L-Tyrosine. L-Theanine (as Suntheanine®): This branded form of L-Theanine showcases high quality than Nootrobox’s simple L-Theanine. Vitamin B6 (as P-5-P): Granted, SPRINT could have this form as well, but their failure to indicate their B6 form makes their B vitamin look less than Mind Lab Pro’s premium P-5-P form of B6. In terms of ingredient choices, both Nootrobox & Mind Lab Pro are on-point. Plus I need to give them special props for not using proprietary blends, staying on the Good Side of the Force by showing all of their ingredient dosages, which are also on-point. So what the hell is there to even compare & contrast here? N-Acetyl-L-Tyrosine: Better than Nootrobox’s L-Tyrosine. Suntheanine: Better than Nootrobox’s L-Theanine. Nootrobox, on the other hand, has one ingredient that’s better than Mind Lab Pro’s (Bacopa)–yet, considering that Mind Lab Pro’s Bacopa is still high quality, along with the rest of its formula, it still seems to have an edge on Nootrobox in this category. The Silicon Tech Valley is strong with this one. Nootrobox’s slick design & formula seem best geared towards the twenty-something techies & creatives, particularly if they’re looking for a more sophisticated delivery of caffeinated stimulation. Nootrobox’s SPRINT delivers the sophisticated caffeine stimulation, and it only gets more sophisticated when you toss in RISE as the nootropic base of the stack. Mind Lab Pro is full-spectrum brain power. Compared to Nootrobox, Mind Lab Pro is undeniably impressive for its ability to increase brain power without drug-fueled stimulation. 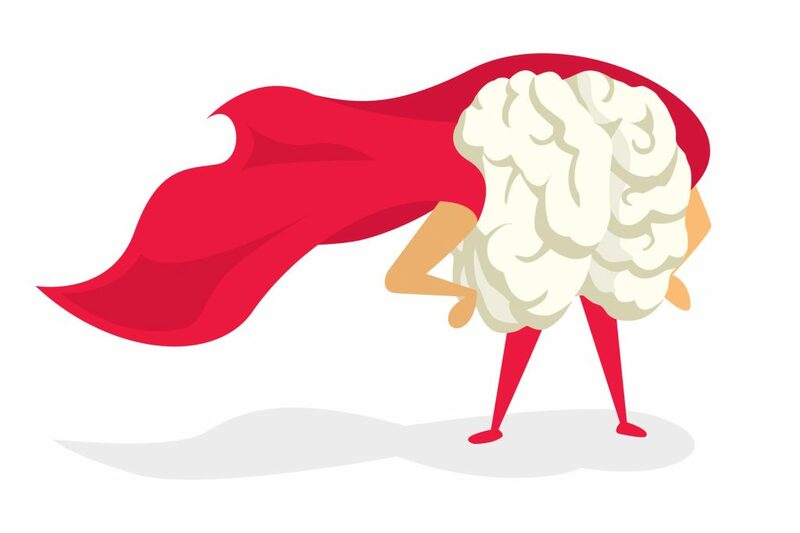 Not that caffeine is a necessarily bad thing, if you enjoy the caffeine (like everyone else in the world), but Mind Lab Pro’s brain power stems from something more important than increased chemical energy: Brain health. The underlying structures of brain health are optimized by Mind Lab Pro for optimal brain function, making it a high value nootropic for now-&-later cognition. Let me just get that out of the way, so you can understand how much I like Mind Lab Pro: I, like, like like Mind Lab Pro. Like a lot. There’s so much it gets right, I’m somewhat surprised that no one else has attempted replicating this formula. Especially given the non-proprietary nature of Mind Lab Pro’s supplement facts. Perhaps no one wants to spend the time, effort, & money to craft such a potent, quality product? I have been taking Mind Lab Pro for about 2 weeks and though it’s effects are subtle, I do notice them. Ironically, I have been contemplating switching to Rise given the higher concentration of the key ingredients I prefer, wondering if they would make a more pronounced difference. Maybe I just need to stick to Mind Lab a bit longer. Thank you for writing this detailed comparison! Any update on your experience with MindLab Pro. I used for a month but just sent back as I didn’t feel I was getting too much of boost – though in all fairness, I was taking greater amounts of Rhodiola and Bacopa prior to MindLab so was also wondering if the more meaningful amounts in Rise might be worth checking out. I really need someone to help me know why Mindlab pro makes me drowsy. I would like to get the benefits everyone raves about or is this just great marketing? I have researched the ingredients as much as I can. Which ones are causing the drowsiness? This is the first I’ve heard of MLP causing drowsiness. While I’ve never experienced side effects with MLP, supplementing standalone citicoline has given me headaches at times — perhaps you’re experiencing a similar reaction to MLP’s citicoline? Otherwise, I can’t imagine what in this formula may be causing your drowsiness. Although, bear in mind that I like to stack my MLP with coffee for the L-theanine + caffeine synergy, so my MLP experiences are often jazzed up with non-drowsy, caffeinated energy. Hey Missy, Just read your review for MLP, I too started taking MLP recently & getting same feeling of drowsiness after taking it, I take it first thing in the morning with my tea, not sure what’s causing that, is it I am empty stomach or some other reason.. not sure, thinking of taking it after my breakfast from now & see, please share if you could find any remedy to avoid same, many thanks ! !